Puerto Rican trap star Bad Bunny has proved once again that he is a true force in Latin music. Taking the stage last night at the 2017 Latin Grammys, which were held at the MGM Grand Garden Arena, Bunny joined J Balvin for an electric performance of their hit "Si Tu Novio Te Deja Sola," a song for which they received a nomination in the Best Urban Fusion/Performance category. 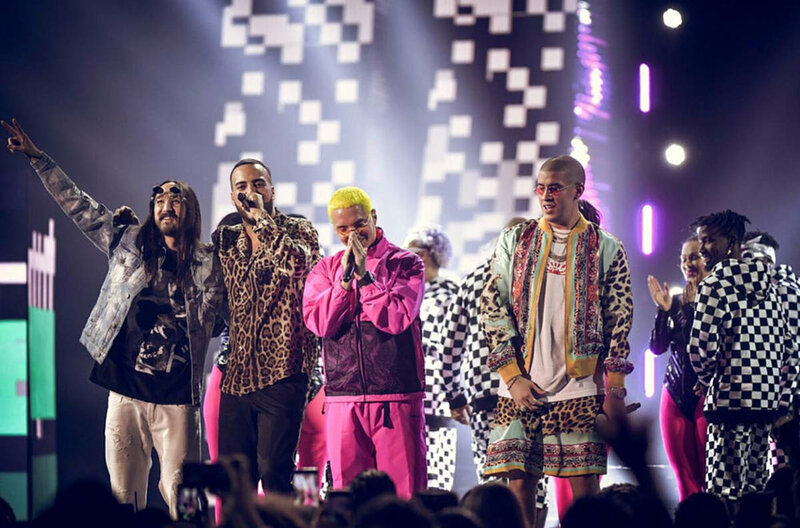 In what quickly became one of the most exciting showcases of the night, the pair later came together with Steve Aoki and French Montana for a full on-stage party to Balvin's worldwide hit "Mi Gente" that brought the house down. The performance topped off a busy Latin Grammy week for Bad Bunny, who has had a year that most can only dream about. Prior to his Latin Grammy performance, on the night before the show, he was the star of a YouTube event where he presented his top hits, surprising attendees with guest appearances by Bryant Myers, J Balvin, and Prince Royce. With almost 1 billion views on his official YouTube channel and a unique fashion sense that continues to captivate fans around the world, Bad Bunny is one of the most in-demand Latin trap artists today. He has released collaborations with the most brilliant stars in Latin music, including Daddy Yankee, Nacho, Yandel, and Farruko, and he was also recently invited to present the first six episodes of TrapKingz, the first Spanish show on Apple Music's global radio station Beats 1.